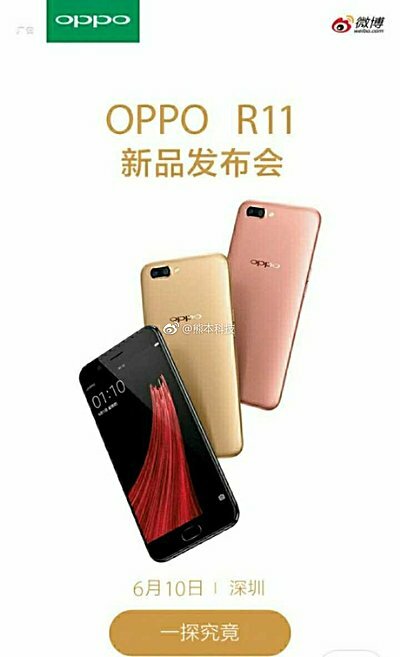 The unveiling date for the Oppo R11 has been revealed – it’s June 10. The information comes in the form of a leaked poster shared by a Weibo user that has the date on it. The R11 has been the subject of several rumors and leaks so far. Recently, the device (along with its Plus variant) received certification from from Chinese telecommunication authority TENAA. The TENAA listing for the R11 revealed some of its key specs, including Snapdragon 660 chipset, 16MP + 20MP rear-camera setup, and 20MP selfie camera. Other details include 5.5-inch Full HD display, 4GB RAM, and 2,900mAh battery.